This Hummer Limo is a top shelf ride that will have you coming back for more! Our hummer limo rental in Lakeland, FL is pure style, comfort, and luxury! It is loaded with every latest feature that you could expect in a luxury hummer, and will make you feel like a million, and not a penny less! Hummers limos are generally considered "the" party limo ride in Lakeland today...it is all the craze! They just have a cool, comfortable, and fun look and feel. 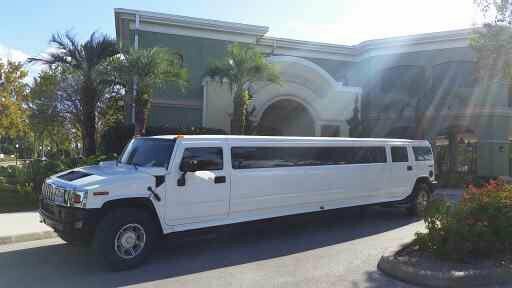 When you roll around town in our Lakeland Hummer limo, you know that you are destined for a BIG time that you'll remember and cherish for years to come. Many of our customers are regular Hummer clients, and they like to rent the same Hummer several times each year! Our Lakeland Hummer rental seats up to 20 passengers, and is great for every possible occasion, including guys night out, wedding hummer rental, bachelor party, bachelorette party, and more! Call Lakeland Limo Service today for a free quote. Give Me My FREE Quote Now!